In its drive to create more apprenticeship places, help is available from the government to pay for apprenticeship training. But what is the cost of setting up a scheme, and how much will it cost your business to get on board? There are three main costs associated with employing apprentices: recruitment, training and salary. If you engage with an Apprenticeship training provider, they can post vacancies on a new Government platform, manage applications and provide you with a shortlist of candidates for consideration as part of its offering and cost structure. Employers can advertise apprenticeship vacancies at no cost via the government’s “Find an Apprentice” recruitment site. Apprenticeships require a proportion of time to be spent on training with a minimum 20% of all their time spent on off-the-job training, so you may wish to find a suitable approved training provider (which can also be done via the government portal). Funding is available however for training, although the amount depends on whether your business pays the apprenticeship levy and your apprentice’s circumstances. If you are a levy payer (with an annual wage bill of more than £3m) you can access some or all of this to fund your apprentice. The government will add 10% to this. 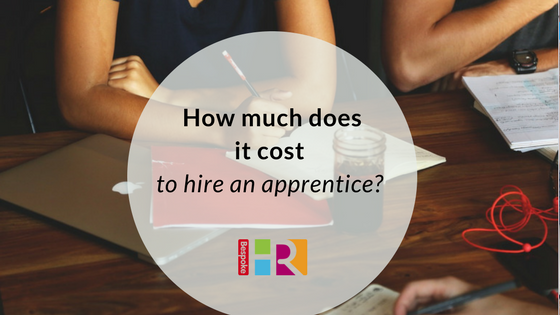 If your business doesn’t pay the levy, you are only required to pay 10% of the cost of training and assessing your apprentice. The government will top up the remaining 90%. Extra funding is available if you are employing young people or those who have been in social care, and you could receive a grant of £1,000. Businesses with under 50 staff will also see 100% of training and assessment costs paid if they recruit an apprentice aged 16-18. Further support is available to SMEs who take on those with additional learning needs. You are legally obliged to pay your apprentice at least the Apprenticeship Minimum Wage which is £3.90 (as of April 2019). This is for both apprentices under 19, and those over 19 and in the first year of their apprenticeship, after that they are entitled to the National Minimum Wage. The government has a useful calculator to make sure you’re paying the correct amount. Read our beginner’s guide to setting up an apprenticeship scheme.